Based on an an article by Hajera Blagg that first appeared in uniteWORKS magazine, January 2016. Benefits sanctions, in which people out of work are punished by having their benefits stopped for often absurd reasons, were significantly ramped up in 2012 under work and pensions secretary Iain Duncan Smith. Since then, stories involving sanctioned claimants dying after their benefits have stopped have made headlines. The most shocking of these was the story of David Clapson, a diabetic who had his benefits stopped after missing a jobcentre appointment. He was found dead in his flat last year with only £3.44 to his name. His official cause of death was diabetic ketoacidosis, caused by severe lack of insulin. The electricity in his home, which refrigerated the insulin that kept him alive, had been cut off; a pile of CVs for job applications was found near his dead body. A coroner found later that, at the time of his death, Clapson had no food in his stomach. 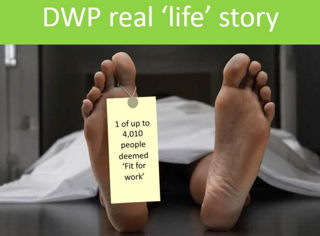 There are no official figures that irrevocably prove that sanctions cause deaths – the department of work and pensions (DWP) has been notoriously reticent in releasing any data. But following intense public pressure and thanks to Freedom of Information requests, the DWP admitted earlier this year that 10 of the 49 benefits claimants whose deaths had been subjected to secret “peer reviews” had been sanctioned at the time of their death. Of these 49 benefits claimants, 40 had apparently involved suicide. While as yet it has been mostly anecdotal evidence that has linked sanctions and death, recent research by the University of Glasgow has unearthed the scale of destitution that sanctions have wrought. Hardship payments, which are available to benefits claimants who have been completely cleaned out of any financial resources and who have no family members or friends who can offer support, have risen in direct lockstep with skyrocketing sanctions. University of Glagow researcher Dr David Webster found that before 2012, hardship payments as a percentage of sanctions ran at less than 10 per cent. But almost precisely after Duncan Smith set in motion the more severe sanctions regime, this number began to climb sharply. Now, hardship payments as a percentage of sanctions stand at a stark 40 per cent. “The figures show that the Duncan Smith regime is creating destitution on a horrifying scale,” Webster noted. And sanctions are set to get worse under the present government, once Universal Credit, a programme that rolls six benefits into one, is fully in place over the next few years. While sanctions now only apply to those not in work, the DWP is piloting sanctions for the lowest paid workers – a chilling development in a sanctions regime that has already thrown so many people into deep and often deadly poverty. In-work sanctions would mean that if struggling workers on low pay earn below a certain threshold and are claiming Universal Credit, they will be made to sign a ‘claimant contract’, pledging to try and increase their earnings, for example, by working more hours. If they don’t meet their ‘obligations’ they face being sanctioned. More hours? They don’t exist when low/zero hours contracts keep so many underemployed! “It will be very difficult for many people to increase their per hour earnings, so this would basically mean taking on more hours,” Unite researcher, Sian Errington, explained. “But where’s the support for this? The government has been very evasive on what additional help there will be to enable low-paid workers to earn more – and there are no obligations on employers.” While the details on in-work sanctions aren’t yet clear, Errington noted that we can probably expect the programme to be put in place for all Universal Credit (UC) claimants once the pilot programme – which Duncan Smith confirmed was now being conducted in parts of the North-West – is complete. This entry was posted in Uncategorized on January 11, 2016 by Bridgend's Green Leftie. Why are people not rioting? It can only be a matter of time!